It’s finally time. Fresh, local strawberries are arriving in abundance in local markets. How I love local, spring strawberries! You can use them in all the traditional ways and this recipe is a nice little twist. I picked it up several years ago when I attended a class taught by Greg Atkinson. It’s always a winner when I bring it to parties. The crust is really more of a shortbread cookie – I’ve often thought of eating it all on it’s own it’s so good. It’s topped with pastry cream and then you finish it with whatever fruit is in season or readily available. Prepare the Almond Pastry ahead of time and keep it at room temperature. Prepare the Vanilla Pastry Cream and keep it refrigerated. No more than 2 hours before serving assemble the tart. Spread the pastry cream on the pastry. (It will be a little stiff so I always give it a good stir to loosen it a bit before spreading.) 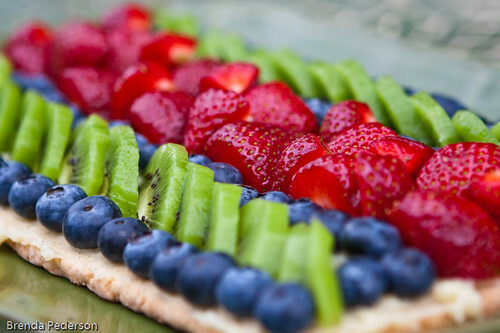 Arrange the fruit in rows (the long way) on the tart. Cut tart into 6-2” pieces and serve. Preheat the oven to 375°F and line a baking sheet with parchment or a silicone mat. Beat butter, almond paste and sugar on medium speed in a mixer or by hand until smooth and creamy. Add the egg white and beat until smooth. Reduce speed and add flour and salt, beating just until combined. Turn the dough onto a floured work surface and form it into a log. Flatten the log into a rectangle and then roll out to 6”x12”. Carefully transfer to the baking sheet. (I like to slide the parchment or silicone mat under it and then lift onto the sheet.) Prick all over with a fork. Bake until the pastry is brown around the edges and slightly puffed, about 15 to 20 minutes. Cool completely on pan then carefully move to the serving tray. 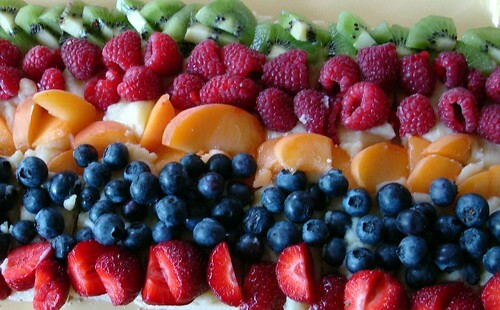 Top with pastry cream and fruit. Put the sugar, cornstarch and salt in a heavy saucepan. Whisk in the egg and extra yolk. When the mixture is smooth, whisk in the milk and vanilla bean. Cook the custard over medium-high heat, stirring constantly until mixture comes to a boil. Whisk rapidly to prevent lumps. When the custard is the consistency of sour cream (this happens pretty quickly) transfer it to a mixing bowl immediately. Remove the bean pod, and then stir in the butter and vanilla extract. Chill the custard completely before using it as a filling. Here are a couple other photos of versions I’ve made in past years. The first photo is a double tart. 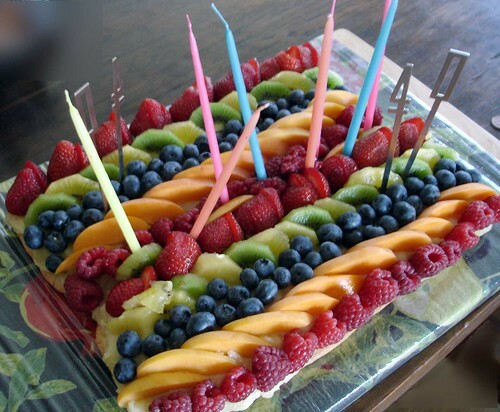 I used extra pastry cream to hide the seam, where the candles are, and added a bit more fruit later to hold the candles up better.